MyHost Review 2019: Is MyHost a Good Hosting? MyHost.ie is an Irish hosting company that deals with domain registration, virtual servers, web hosting, email hosting, dedicated servers, and premium SSL. It offers simple and reliable hosting solutions and true local customer support. 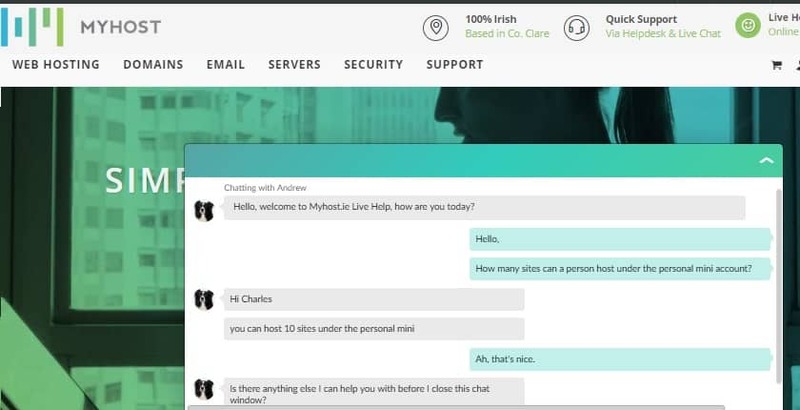 MyHost.ie is a privately owned hosting company that offers a range of enterprise-grade hosting solutions including shared hosting, VPS, and dedicated resources besides professional email, spam filtering, Office 365, and SSL certificates. It operates out of a secure facility in South-West Ireland. I have never hosted my website with any company that has a history of downtime. With an uptime guarantee of 99.5%, MyHost.ie measures up to my expectations regarding speed and performance. Its Cloud-based servers are easy to replicate and are connected to a distributed storage with SSD caching and disaster recovery options. The fact that they’re not overloaded means websites load faster at MyHost.ie than on most standard shared hosting accounts. Securitywise, MyHost.ie uses firewall and DDoS protection as the first line of defense for websites and user data. At the personal level, customers can password-protect their directories, enable spam filtering, and upload files via SFTP access. But what really impressed me is that servers are self-healing. Whether a hacker tries to take it offline or it develops a system problem, it will restore itself and continue running. MyHost.ie also offers customers an easy-to-use website builder with 1,000s of prebuilt templates that they can use to create personal blogs or business websites. It has an intuitive drag-and-drop interface that lets you customize your web pages before you publish. I encourage you to test drive the builder (the demo is free!) before placing an order. Though MyHost.ie’s hosting plans have no hidden fees, its annual and biennial packages aren’t cheap by any standard. I am not trying to discourage you, just add any of the extras such as website backup storage, OS + panel updates, SSL, and intrusion prevention system, malware prevention, and IP blacklisting and you will get a clear picture. You have 30 days to test drive its hosting services and upgrade or cancel and ask for a refund. Technical support is available via telephone, online ticket, and email, though you can also make inquiries via Facebook page. Andrew, their live chat support rep, responded to my query helpfully when contacted. Cases are resolved within one hour if you contact support between 9:00 a.m. – 5:00 p.m. GMT. If you need answers or help with simple hosting issues, the best place to start is with the FAQ and video tutorials’ section. With a range of powerful and reliable hosting solutions MyHost.ie is worth considering if you want ample resources for your personal blog or business website, in addition to real local support. Wondering how MyHost stacks up against other Web Hosting companies? Enter any other Web Hosting company and we will give you a side-by-side comparison.